Adelicia Hayes Franklin Acklen Cheatham (1817–1887) was one of the wealthiest women of the antebellum South. Her first husband died in 1846, leaving her an inheritance valued at approximately $1 million, which included seven Louisiana cotton plantations, a two-thousand-acre farm in Gallatin, Tennessee and hundreds of slaves. While Joseph Acklen was a great help to Adelicia in the operation of her many properties, she was actively involved in the management of her businesses, especially after his death. 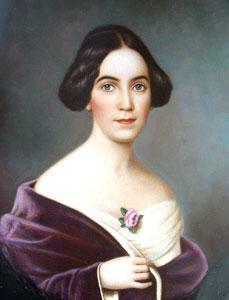 Adelicia Hayes was born on March 15, 1817 into a prominent family in Nashville, Tennessee. Her father was Oliver Bliss Hayes, a lawyer, judge and cousin of Rutherford B. Hayes, 19th President of the United States. Her mother was Sarah Clemmons Hightower Hayes of Franklin, Tennessee. Adelicia attended the Nashville Female Academy and at 17 was engaged to Alphonso Gibbs, a Harvard graduate who died before the wedding. At the age of 22, Adelicia married Isaac Franklin, a wealthy businessman and plantation owner who was 28 years her senior. Isaac and Adelicia had four children together, all of whom died before the age of eleven. After seven years of marriage, Isaac Franklin died unexpectedly of a stomach virus while visiting one of his plantations in Louisiana. At the age of 29, Adelicia was left with an inheritance valued at approximately $1 million: Fairvue Plantation, a 2,000-acre farm in Gallatin, Tennessee; 8,700 acres of cotton plantations in West Feliciana Parish, Louisiana; more than 50,000 acres of undeveloped land in Matagorda Bay, Texas; stocks and bonds; and 750 slaves. On May 8, 1849, Adelicia married Joseph Acklen, a Mexican War hero and lawyer from Huntsville, Alabama. Acklen signed a prenuptial agreement one of the earliest in Nashville history – giving his wife complete control of all the businesses, property and assets she brought to the marriage. They had six children, two of whom died young: Joseph, Laura, Corinne, William, Claude and Pauline. Twin daughters Laura and Corinne died young from scarlet fever. The Acklens immediately began building their dream home, which they called Bellemonte, Italian for beautiful mountain. Belmont Mansion was a twenty-thousand-square-foot Italian-style summer villa built on one of the highest hills in Nashville, on 180 acres given to Adelicia by her father. 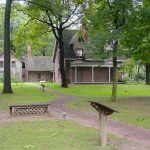 It was one of the few nineteenth century homes whose history revolves around the life of a woman: Adelicia Hayes Franklin Acklen. Construction of the Belmont estate was completed in 1853. There were numerous outbuildings, including the water tower, a two-hundred-foot long greenhouse and a conservatory. Also on the grounds were an art gallery, gazebos, a bowling alley, a bear house, an aviary, a lake and a zoo. There were no public zoos at the time, so Adelicia Acklen opened the estate to the citizens of Nashville. With this new addition, Belmont Mansion contained 36 rooms and approximately 10,000 square feet of living space. An additional 8,400 square feet of service area was located in the basement. The house was filled with fine furniture, paintings and marble statues. The Acklens lived a sumptuous lifestyle, living on their Louisiana cotton plantations in the winter, and staying at Belmont during the summer to escape the heat of the Deep South. Joseph Acklen, a superb businessman and plantation manager, gave up his law practice to manage the family businesses, and he had tripled his wife’s fortune by 1860. Every year Adelicia gave a grand ball, which was always held during a full moon, to allow the visitors to see the mansion in all its glory. At Belmont, she entertained such notables as President Andrew Johnson, inventor Alexander Graham Bell, socialite Octavia La Vert, philosopher Thomas Huxley and soldier of fortune William Walker, as well as numerous Confederate officers and political figures. During the Civil War, Nashville became the first major Confederate city to fall to the Union army. In February 1862, at Adelicia’s suggestion, Joseph fled to Louisiana, where he could personally oversee the plantations that were their main source of income. Joseph Acklen died on September 11, 1863 at the Angola plantation in Louisiana at age 47, apparently of an illness contracted following a carriage accident. According to family tradition, Joseph’s carriage plunged into a bayou, forcing him to walk home in wet clothes, which led to him coming down with a fatal fever. They had been married for 14 years. At the time of Joseph’s death, there were approximately 2,800 bales of Acklen cotton in storage in Louisiana. 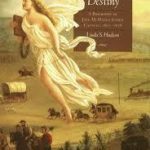 Soon after, Adelicia stood to lose a fortune when the Confederate army threatened to burn her cotton to keep it from falling into Union possession. On January 1, 1864 Adelicia Acklen and her cousin Sarah Ewing Sims Carter (both widows) made a bold trip to Louisiana to save the cotton. Confederate General Leonidas Polk, cousin of former US President James K. Polk, was issuing orders to burn her cotton. Adelicia had grown up in the same neighborhood as the general, and he had attended her wedding to Acklen. When they arrived at Angola plantation, Adelicia and Sarah were arrested for not having a travel pass. Once it was verified that Adelicia was a friend of General Polk, they were released. Adelicia fell ill and Sarah stepped in and negotiated the disposition of the cotton. After some hard bargaining, General Polk gave permission to store the cotton in a safe location along the Mississippi River. Confederate mules and wagons picked up the unprotected cotton from Angola plantation and delivered it to the safe location. Learning that Federal gunboats in the area were to be inspected by Admiral David D. Porter, a meeting was set up with the Admiral to find out what could be done about shipping the cotton to New Orleans. Admiral Porter and Captain Ramsey of the gunboat Choctaw issued a permit, and a Union gunboat delivered the cotton to New Orleans. Adelicia Acklen, finally on the mend, traveled to New Orleans and sold her cotton to the Rothchilds of London for a reported $960,000 in gold, and made arrangements to have the 2800 bales loaded onto a blockade runner en route to Liverpool, England. It was common knowledge that the price of cotton in the South had dropped to nothing and cotton demand in England was high. My cousin’s husband Col. Acklen died in Louisiana, leaving a large amount of cotton on the plantation, unprotected. She insisted on my going down with her, thinking she could sell the cotton in New Orleans, which would have been impossible, as it was in Confederate lines and being watched. The (Federal) navy gunboats were on the river nearby. I went one hundred and fifty miles eight times, in the Confederate lines – to Jackson and Clinton, Louisiana, and finally got permission for her to ship the cotton to Europe. Then we got from (Federal) Admiral [David] Porter and Capt. Ramsey, of the [gunboat] Choctaw, a permit to take it to New Orleans…. It was a tremendous undertaking, and I felt very proud that I had been the cause of saving her cotton, which so few had succeeded in doing. Three weeks after Robert E. Lee’s surrender in 1865, Adelicia and her children left for Europe to retrieve the money she had made from the sale of her cotton. While there, Adelicia took her family on an extensive tour of Europe, and they were presented to the court of Napoleon III in France. In Rome, Italy, Adelicia purchased several statues for Belmont Mansion. These monuments were created by well-known American sculptors, such as Randolph Rogers, William Rinehart, Chauncey B. Ives and Joseph Mozier. The family remained abroad until 1866, when they boarded the ship Scotia and sailed for New York, and then home to Nashville. During the occupation of Nashville, the Belmont Mansion was the headquarters by Federal officers, including Generals David Stanley and Thomas J. Wood for two weeks before and during the Battle of Nashville, which was fought on December 15 and 16, 1864. Thirteen thousand Union troops were camped on the grounds, and the mansion was located on the Union fortification line. General Thomas Wood, commander of the Fourth Corp of the Union army, requested that Adelicia move her valuables to her friend’s house in Nashville. 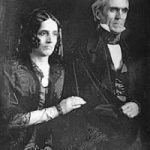 That friend was Sarah Polk, widow of President James K. Polk. As the widow of a President, Sarah was treated with great respect by the Union Army, and it is possible that she informed Federal officials that Adelicia was her friend and to treat her with respect. 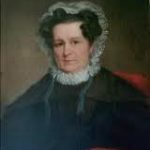 There is no documentation that indicates that Adelicia and her children stayed with Sarah Polk during the Battle of Nashville, but there are indications that they spent at least part of the first day of the battle with Polk’s widow. When Belmont was returned to Adelicia, she found her home and its furnishings had been well cared for by Federal officers. Some outbuildings were damaged because they were on the front lines, and had to be removed to provide a clear field of vision for the soldiers. The water tower was used as an observation post and to relay signals. After the Civil War, when many in the South found themselves bankrupt, Adelicia Acklen continued to flourish, mostly due to the rescue of her Louisiana cotton. When Adelicia married Dr. William Archer Cheatham, a widower and respected Nashville physician, in 1867 he also signed a prenuptial agreement, giving him no claim to Adelicia’s wealth. She was 50; he was 47. Their wedding reception took place at Belmont, with about 2,000 guests in attendance. By the 1880s, Adelicia was spending more time in Washington, DC. In 1886 she left Nashville and Cheatham, and moved permanently to Washington, DC with three of her adult children, including her only surviving daughter Pauline. The exact cause of her separation from Cheatham is not known. On January 11, 1887, Adelicia sold Belmont for $54,000 to Lewis T. Baxter, a member of a land development company who planned to develop the estate into a subdivision. Adelicia Hayes Franklin Acklen Cheatham contracted pneumonia while on a shopping trip to New York City, and died in a Fifth Avenue hotel on May 4, 1887, at the age of seventy. Her body was returned to Nashville to be buried in the family mausoleum at Mount Olivet Cemetery with her first two husbands and nine of her ten children. Susan L. Heron and Ida E. Hood from Philadelphia purchased Belmont Mansion and 13 acres, where they planned to open a women’s school. Modeling their school on the women’s colleges of the Northeast, the women began by adding a building to the back of the mansion facing the new street called Wedgewood. The new school opened on September 4, 1890. The upstairs and most of the downstairs bedrooms, the formal dining room and the billiards room of the Belmont Mansion had been divided into dormitory rooms. The winter parlor became the school library. Between 1905 and 1909 two new buildings were added to the school. In 1913, the auditorium on the first floor of the north building was enlarged and twenty feet of the back two wings of the house were removed. Belmont College for Young Women merged with Nashville’s Ward Seminary in 1913 to form Ward-Belmont College, the first junior college in the South to receive full accreditation by the Southern Association of Colleges and Secondary Schools. By the 1920s, it had an enrollment of more than 1,200 women. In 1952, the school again changed ownership, becoming present-day Belmont University, which today is a coeducational, liberal arts school offering bachelor and graduate degrees. 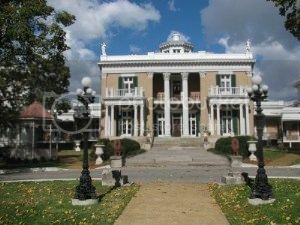 Today, Belmont Mansion is the largest house museum in Tennessee and one of the few nineteenth century homes whose history revolves around the life of a woman: Adelicia Acklen.